The 133 suite, 6-story hotel is located at 305 North Cattlemen Road, right off Interstate-75. This is Buffalo Lodging's third hotel in the Sarasota market, 11th hotel in Florida. “This is an exciting time for Sarasota County as the destination recently experienced a record-breaking number of visitors from around the country looking for a relaxing Florida getaway*,” said Jan Stanek, general manager. 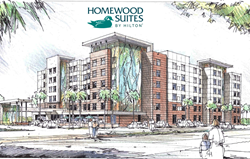 Homewood Suites by Hilton all suites portfolio, announced today its newest property, Homewood Suites by Hilton Sarasota Lakewood Ranch. Designed for guests who want to travel on their own terms, Homewood Suites by Hilton Sarasota Lakewood Ranch offers guests all the comforts of home, whether they are traveling for work or enjoying a well-earned getaway. With 133 new suites, the hotel is a short drive away from Sarasota’s world-renown beaches and is adjacent to University Town Center, providing guests convenient access to shopping and entertainment options. “This has been a special kind of project for us. The high quality standards set by the University Town Center retail development provided our benchmark for this hotel," stated Ron Kendall, president of Buffalo Lodging Associates." "This Homewood Suites is designed to be a landmark development in which our company takes great pride. We hope the community shares our feelings and thank everyone involved for their help and cooperation", added Kendall. Developed and owned by Benderson Development Company, Inc. and managed by Buffalo Lodging Associates, LLC. Homewood Suites by Hilton Sarasota Lakewood Ranch offers a combination of studio and one-bedroom accommodations, featuring fully equipped kitchens and separate living and sleeping areas. Guests are also provided all the essentials needed for a smart, reliable and convenient stay including complimentary daily full-hot breakfast, evening social Monday-Thursday, Wi-Fi and a grocery shopping service**. Homewood Suites by Hilton Sarasota Lakewood Ranch also makes it easy for travelers to unwind with an outdoor pool, whirlpool spa and patio featuring a fire pit. The property offers more than 1,000 square feet of flexible meeting space that can accommodate up to 80 people for corporate and social events. Located at 305 North Cattlemen Road, right off Interstate-75, Homewood Suites by Hilton Sarasota Lakewood Ranch is located near The Mall at University Town Center, which features world-class fashion and dining, Nathan Benderson Park, a unique 600-acre community park, and The Premier Sports Campus at Lakewood Ranch where a variety of field sports events are hosted. Guests can also take a short drive to Siesta Key Beach where they can explore an 8-mile stretch of some of the finest and whitest sand in the world. Sarasota-Bradenton International Airport is approximately 15 minutes from the property as well. For more information or to make a reservation visit http://www.homewoodsarasota.com or call (941) 309-3904.